With the end of the first quarter, comes the inevitable project presentations. While showing off one’s history project or sacred geometry designs is usually anticipated, there is one presentation in particular that deserves recognition: the films created by Grace film majors. These short films have been scripted, casted, shot and edited to perfection for their final screening which will be open to anyone who is interested. The Film Major class is exclusive and each interested student is vetted for a chance to be enrolled. The process begins in the final months of sophomore or junior year when it comes time for next years’ course enrollment. Interested students submit their application, which includes all of their film and photography experience – both in school classes or clubs, as well as extracurriculars. In the spring, all students who applied watch an assigned film and write an appropriate analysis based on what they thought of the movie, looking closely at how it was made, as well as directed and edited. This prepares the students for what is to come as a Film Major by inviting them to critique the film not as a viewer, but through the eyes of the director and editor. Shortly after, Mr. Todd selects a small group of well equipped students to partake in the Film Major program. It is then that they can begin the new school year with the exposure and inquisitive mindset needed to begin making their own films. The Film Major was introduced to Grace in the fall of 2017, and it has already become a huge success. Since the opening of the high school, especially during March Madness, it has been clear that many students had a passion for film and photography. “Student passion led to the development of a film club and an art elective called The Moving Image.” said Mr. Todd, Film and Photography Teacher. 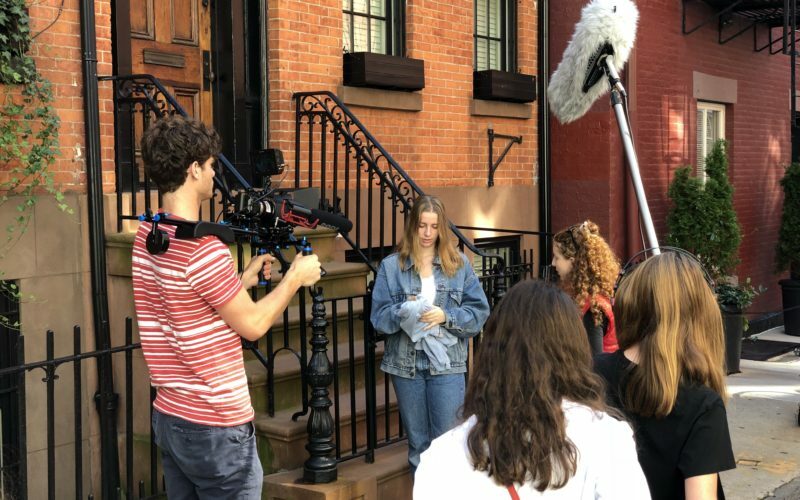 “As student interest continued to carry momentum it was decided that a year-long course would be a perfect format to allow students to immerse themselves in the practice of filmmaking. 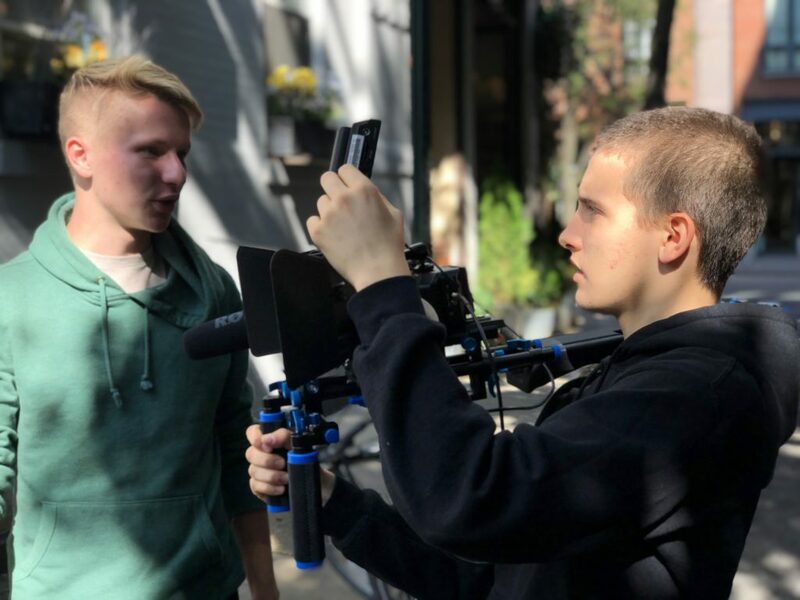 With a longer class period that meets all year, students can devote the appropriate amount of time needed to make quality short films as well as gain a cursory understanding of film and media history.” With such a keen group of students, Mr. Todd had to create a curriculum that would invigorate the class. It was decided that the Film Major program would be comprised of four styles: adaptation, documentary, experimental/ avant-garde and fictional narrative. “I want the students to understand both the mechanics of film and media production, scriptwriting, cinematography and editing, as well as their place in film and media history.” Mr. Todd enthusiastically said. Film Major Casey Donnelly ‘20 chose to do her film adaptation of the book, “We’ll Go Ask Alice”, which details the experience of a teenage girl becoming addicted to drugs through a series of journal entries. After going through scriptwriting and revisions, she went right into shooting the film, which, for the most part, was completed in a day. Even though the shooting ended up spanning several days, she made the most of her time by beginning to edit fairly early on in the process and continuing to do so up until the night before it was due. Casey mentioned that she had not had much experience with filmmaking prior to becoming a Film Major and she did not realize how much it would interest her. “Like anybody else, I love watching movies, but once the class was introduced to me I became more curious about the process of creating a film,” Casey commented. Through diving into the process of shooting films and being able to express her creativity cinematically, Casey has gained a deep appreciation for the work that goes into filmmaking. For his film, James Karasyov ‘20 produced an adaptation of “A Clockwork Orange”, which is a dystopian, yet comedic, novel focusing on youth violence in a future English society. In his adaptation he aims to emphasize, “The consequences of the idea of censoring and brainwashing a populous.” To produce this film, James spent two weeks organizing and writing his script and scene directions. The filming was completed in two hours, and he continued to edit for the three days following. James had experience with making films prior to becoming a Film Major, as it is one of his passions. In the coming quarter, Mr. Todd will be exploring documentaries with the Film Majors. “They are going to learn the legal aspects of filmmaking, how to conduct an interview and the forms that come with documentary filmmaking,” Mr Todd stated. Before the transition from adaptation to documentary, the finished short films will be screened in the auditorium from 4 to 6pm on November 7. This is a wonderful opportunity to view the projects that your fellow students put together using their own skills and creativity in order to produce intriguing and professional level short films. Watch the short film Mina Parson ’20 created this quarter.